banter which held in Osogbo, the state capital on Sunday. The lawmaker said while they were on their way to Osogbo, a community where they had gone to campaign blocked the highway, adding that they (community) had been marginalised all these years and that there had not been developments in their area. Rasheed told Premium Times; “To our surprise, while we tried to skip the small towns and villages as we made efforts to meet up, they started trooping on the road; As I am talking to you now, we are just entering Osogbo. 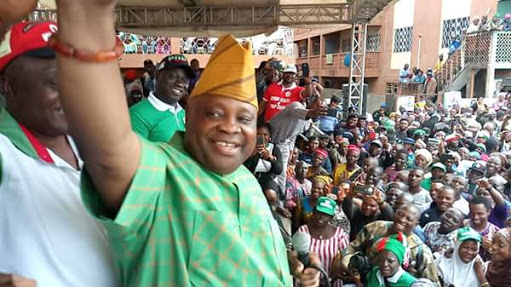 “We did the same thing at Ikirun, trying to avoid some villages, then we had a backlash from the voters, they insisted that they wanted to hear the man (Adeleke) personally speak to them. “The last village that we attended at Ife East, they were complaining that they had had no light for years, they trooped to the road and blocked our path and this was around 7.30 p.m.
“ What we did was to send a message to a correspondent of Channels, and later I sent a message to Seun Okinbaloye (Channels presenter). We are just entering Osogbo now as I speak to you.